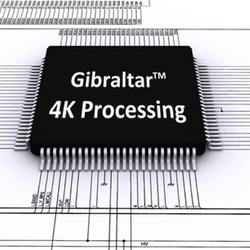 The Gibraltar™ 4K Formatter Hardware Reference Design enables high-performance display and imaging with the native 4K DMDs (1.38") from Texas Instruments Incorporated. Designed for 3-chip DLP® projection systems, the Gibraltar™ 4K Formatter design integrates a high-performance Xilinx FPGA and DDR3 memories to fully leverage Brass Roots Technologies’ advanced firmware-based GibraltarTM Processing architecture, which converts video and graphics input data into high fidelity, floating-point multi-toned PWM bit-planes for the native 4K DMD. Incredibly high-bandwidth bottleneck-free processing supports sustained throughput at full DMD data rate (57 Gbps) and enables ultra-HFR display performance up to 360 frames per second at native 4K resolution. A distinguishing feature of the Gibraltar™ 4K Formatter design is a high-bandwidth, multi-channel SerDes Input Data interface. A wide range of input data formats are flexibly supported with minor firmware reconfiguration of the SerDes receivers. The Gibraltar™ 4K Formatter Hardware Reference Design is available to OEMs and Product Developers under license that also includes a commercial license to Brass Roots Technologies' advanced Gibraltar™ Processing technology. Please use the form on this page to Contact Us for more information. Ready for more information? Complete this form and get a response within two business days.